As well as experimenting with different fusing programs. I keep finding patterns I want to make that take a bit of thinking. I really wanted to make some cotton reels but I couldn't work out a way to get the angles right for the spool and the background. I was playing around with another design when it struck me that I could draw a template with cutting lines, cut out 2 squares into the same shapes then mix and match them. Just like the stack and slash method for quilt blocks. 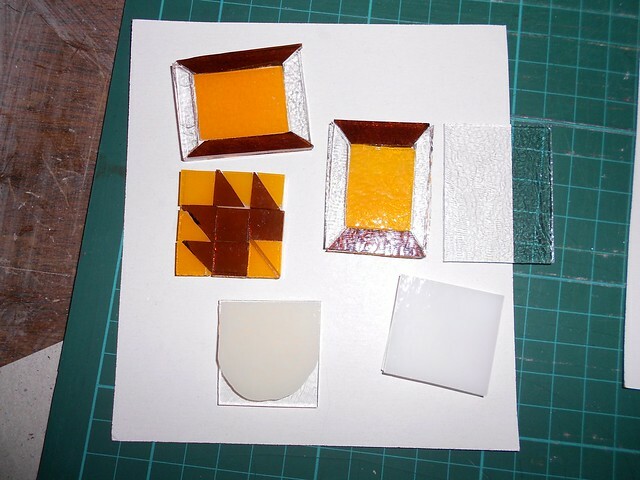 Here are some templates for cutting. 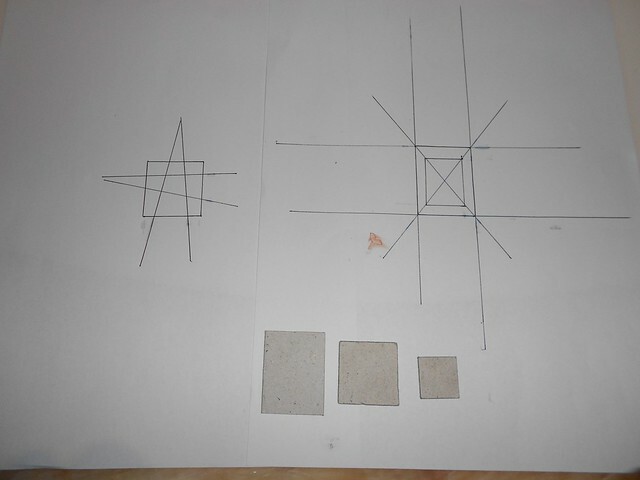 The cardboard pieces are to trace around in my design book so I can make designs the right size. The one on the right is for the cotton reel. The one on the left is for the wonky 9 patch. I made two in pink and purple. Nothing is fired yet. I need to make up enough pieces to fill the kiln. We really wanted to make some transparent earrings and use plastic posts but when we put the posts on and tried to put the backs on they were pretty wobbly and the back nuts were difficult to get on. They have all gone in the give away pile. We won't be buying any more plastic earring backs or making transparent earrings. A shame, because they do look pretty. 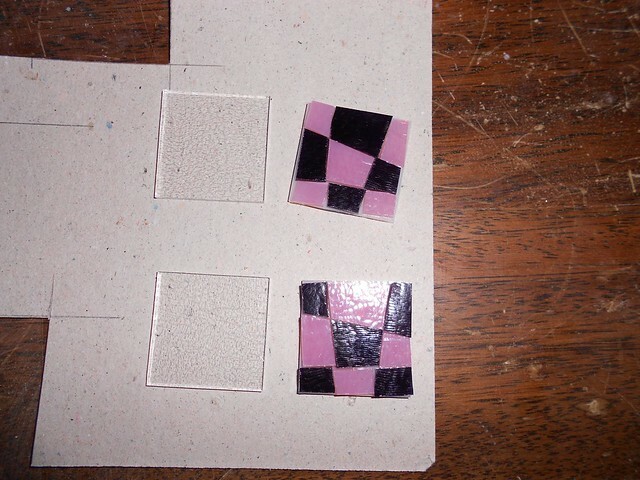 I spent several days working on the card design to mount the earrings and pendants. It looks great and we have attached lots of earrings and some pendants and buttons. We have a business meeting most mornings at breakfast and I record all our ideas using the Inspiration app. I like using boxes and arrows rather than a simple list. Here are some of the pendants ready to go.